With it's name alone, The Yummy One has quite a reputation to live up to. 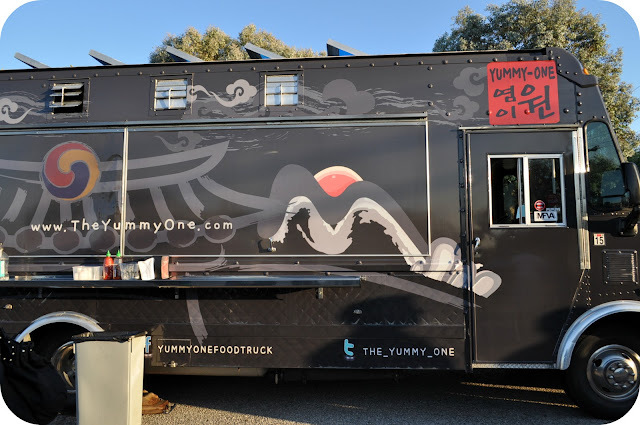 It seems bold to outright guarantee that your truck is yummy but with the Korean cuisine that this truck is turning out, I'd say they're safe with the name. Curry Rice Bowl with Korean BBQ Beef "Bul-gogi"
My youngest brother is a curry fiend. I swear, that kid is secretly Asian so he was definitely the biggest critic this curry bowl had to face. Personally, I'm not a huge curry fan myself but such is the job of a food blogger, haha. Anywho, this curry was pretty spectacular. It had some kick to it, which gave it extra points in my book, but the heat also added an extra bit of flair to what appears to be an ordinary dish. 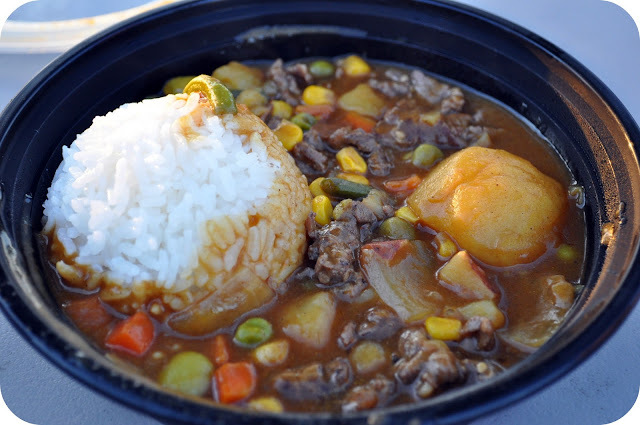 The curry itself had peas, green beans, carrots, corn, potatoes, and Korean BBQ beef which all worked together in flavor harmony. The element that stood out most to all three of us was the corn. A seemingly simple addition however among the heat and heartiness of the dish it brought in a sweet element that really made the curry as a whole flow perfectly together. The rice was fluffy and oh so delicious when you got a sauce covered bite. I will definitely eat at this truck again, especially because they have an option where you can get the curry over...wait for it...FRIES. Yeah. You read that right. I'm talking about curry fries. I bet it's absolute heaven.